This is my first attempt at nail art since chopping of a massive chunk of nail in a tabbouleh making accident a few weeks back. If any of you own Global Knives then you know how dangerous they can be, especially if you suddenly think you are on Masterchef. Today’s look is a base of Malaysian Mist by OPI. 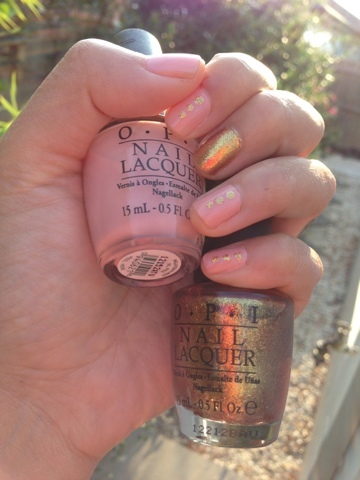 It’s one of my favourite every day colours and is a warm toned pale pink which I have highlighted with Golden Eye by OPI’s Bond Collection which is a very fine gold glitter polish. The look is finished with some more gold polka dot detailing.